Discussion in 'Rugby League Forum' started by lsz, Mar 14, 2016. Wests Tigers coach Jason Taylor has backed the club's decision to offload Marty Taupau a year early, describing his release as "a good business decision". 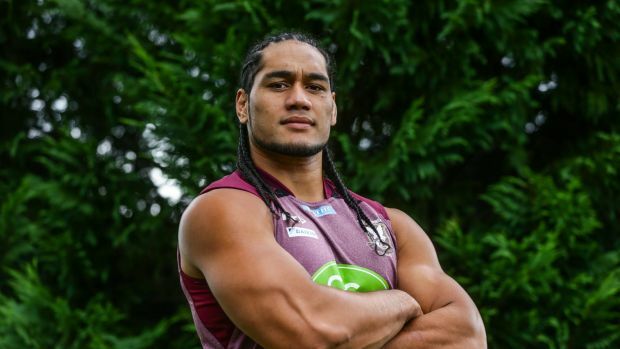 Taupau, who joined Manly in the preseason, will return to Leichhardt Oval in a homecoming of sorts on Monday night. While Taupau developed into one of the most damaging props in the game at the Tigers, the club has stood by its decision to allow him to join the Sea Eagles 12 months prior to the initial terms. The Kiwi international looked set to play out 2016 at the Tigers before linking with Manly the year after, but the joint venture allowed him to leave in the pre-season in the hope of retaining some of their young players. The Tigers were hoping to keep Taupau but they were unable to match an offer from the Sea Eagles, with Taylor sticking by the club's decision to let him go a year in advance. "It was a good business decision for us," he said. "As far as holding on to someone for one year longer and risking losing some young players who play in the same position or letting go of that person now and then help secure those younger players. And not just one, a few. It was a very sound business decision that one." The Tigers will head into the round two clash buoyed with confidence after a first-up victory against the New Zealand Warriors. However, the Sea Eagles had a contrasting opening outing, ambushed by a fired-up Bulldogs pack at Brookvale Oval. "It's really hard to predict how they're going to play," Taylor said of the Sea Eagles. "There's a number of changes to their team and they wouldn't be comfortable with the way things went last week. "We're expecting a real strong performance from them. A really aggressive performance. I think the Bulldogs probably showed them the way to play last week. "They'll take a fair bit of inspiration out of that and we have to be ready for that. They will play with a lot more commitment and energy right from the start. They were probably a little bit [on the] back foot at the start of the game. We'll be ready for a real aggressive team on Monday night." One of the most exciting match-ups will be between the two No.1's, as James Tedesco squares off against promising Manly flyer Tom Trbojevic. Tedesco was at his best in the win against the Warriors, with the coach backing his fullback to continue his red-hot form against Manly. "For me it was a continuation of how he finished last year," Taylor said. "Teddy was our best player consistently for us last year. It's great that he continued that form into round one. We need that from him." This is his chance. If he can't lift tonight and inspire our other forwards then 2016 will be a longer season than 2015. Marty! Go off tonight! This is the opportunity to become a wrecking ball tonight. Throw defenders around, smash tigers forwards and then do the throat slit gesture to Jason Taylor. Yet here he is, in the backrow. Sacking JT would be a good business decision.